Presented with the above data, we worked through our notice & wonder routine using Pear Deck. Students estimated how many days before that would happen via Pear Deck. Then we had turn & talk time with our visibly randomly grouped (VRG) partners to discuss what we should measure, look up, and/or calculate in order to solve the problem. We shared our thoughts to the whole group. Asked them to sketch their graph from Desmos on their board. We had a follow up day where I walked them through interpreting a couple of different graphs of system of equation scenarios. The whole activity is available in this slidedeck that has added Pear Deck interactivity if you use their add-on. A month ago or so I read a post by Mr. Hogg about his Fast Walker activity. 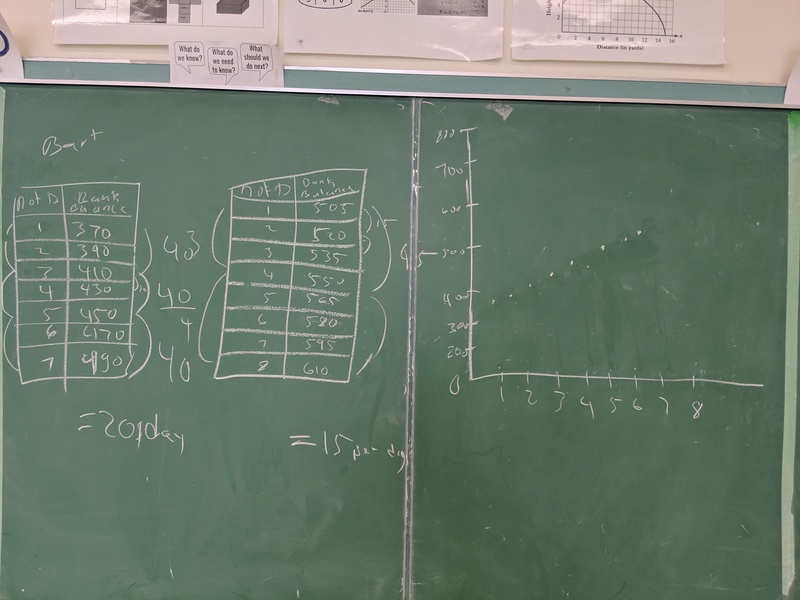 I thought it would be a great way to introduce linear systems graphically to my combined grade 9 math class before the end of the semester. I also did this activity with my Grade 10 applied students – next semester I’ll use it as an introduction to systems graphically with them earlier in the course. If you want to cross the finish line at the same time as Joe, what distance head start will you need? We went out to our 400m track and students measured out their starting position. They staggered themselves according to their calculation (photo below – tried to take video but my phone battery died). Most students were around 100m before the finish line (~300m head start). We counted down & Joe started running & the class started walking. I so wish I’d gotten the video because it was awesome how close they all finished to each other! We discussed which line was partial variation & which one was direct. I then introduced the language of “linear system” and “point of intersection”. My 2P class time to create an equation for each line also. The next time I try this, I’d like to add an individual follow up question such as if you only had a 50m head start, at what distance would you & Joe meet? At what time would that be? Here are my files for this activity (the unassociated one is the Pear Deck slideshow). This is 2nd time blogging about this problem. 1st time-around post is here. What do you notice (facts)? What do you wonder (questions)? 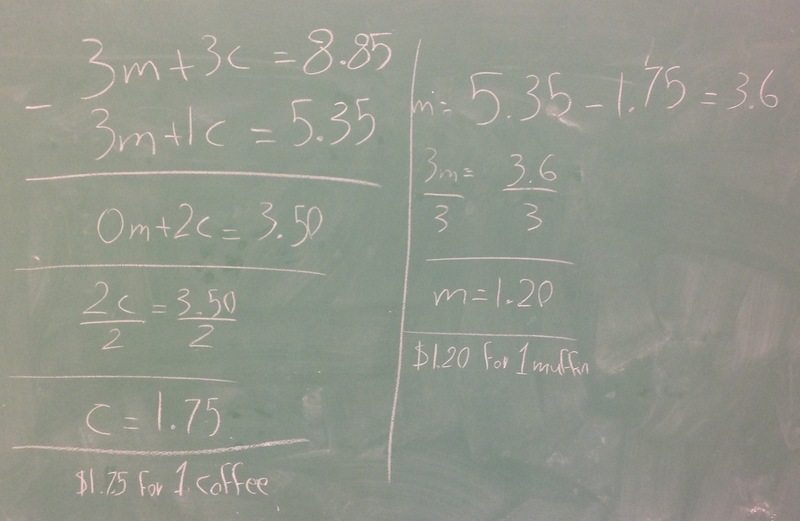 Adding 3 extra coffees cost more by a little How much with it cost for 4 coffees and 4 muffins ? why is the kid buying coffee? whys the kid buying coffee? The totals are different on each side. One side has less drinks. How much is each item? 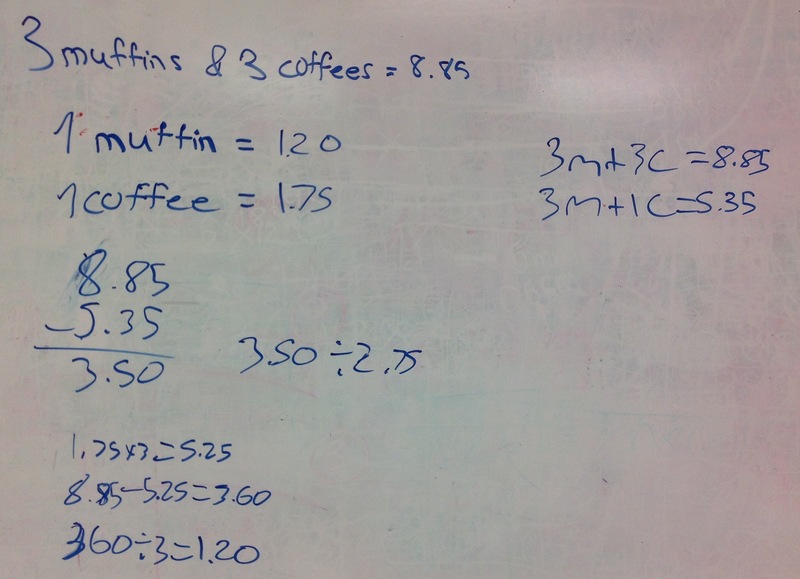 For the first indivdual, it costs $8.85 for three cupcakes and three coffee cups. 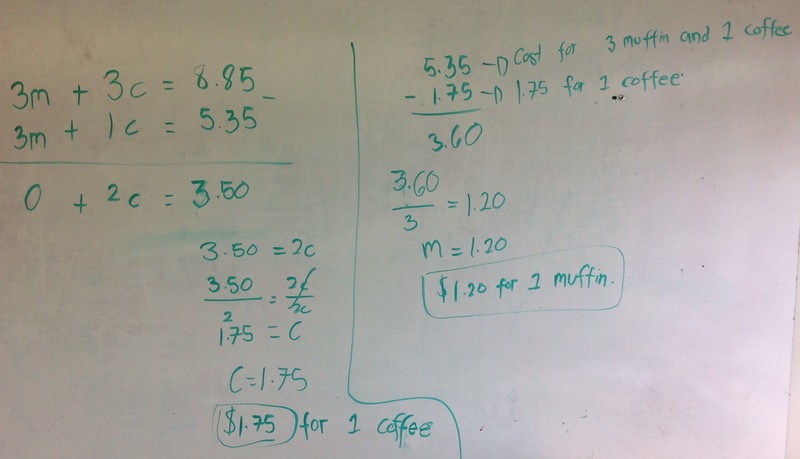 For the second person, it costs $5.35 for three cupcakes and one cup of coffee. Im curious about what brand of coffee that they are buying. It seems potentially no name or even something like a corner store kinda coffee. ew. oh yeah also how much do they each cost? – They both ordered 3 muffins, but one had 3 cups of a drink and the other ordered one. – The one that ordered 3 cups, have to pay more. – How much does one drink cost? – How much does one muffin cost? – Does the person on the right have a better deal than the person on the left? We compared the solutions of the different groups and picked out the one board that had the most correct formatting of an algebraic solution. I drew parallels between their work during elimination and their earlier logic, pointing out how they are both eliminating something (I explained this more in depth & more eloquently). 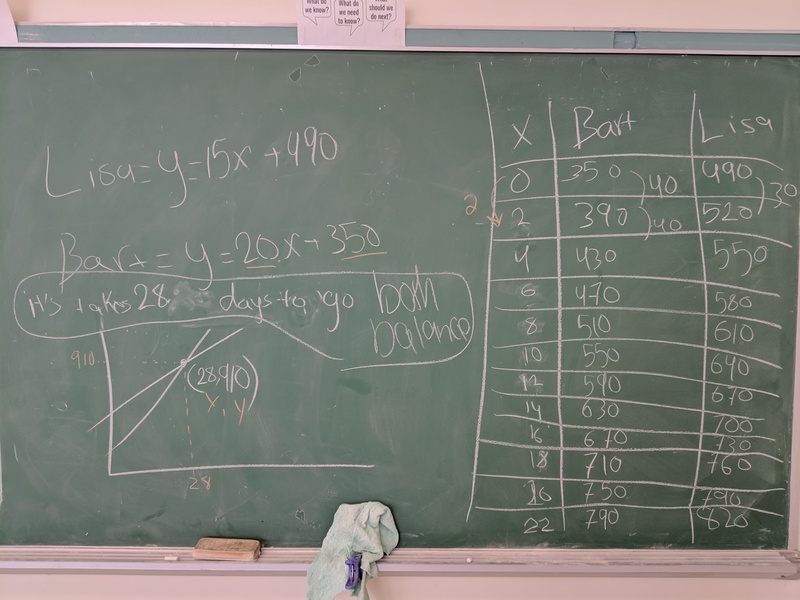 The individual practice to wrap up was a Khan Academy exercise set on elimination not involving any multiplication of equations. I’m already behind on my goal of blogging all of my MFM2P (grade 10 applied) activities for the semester. We did this one about 3 weeks ago. All materials for this activity are here. My plan was to blog about every problem-based learning activity I did this year. I did not succeed; I think I blogged about two from the my MFM2P course? So as a runner up to a full blog post reflection on each, you’re getting one post with a summary image of each activity or problem & a link to my materials for it. I’ll group them by strand here, but they are not listed in the order that we did the activities. If you’d like to see the progression of activities I used, you can see that here. 26 Squares: This one I did manage to blog about. Gummy Bears: I did blog about this one here. 26 Squares: I did blog about this one. Not every lesson we did was problem-based. 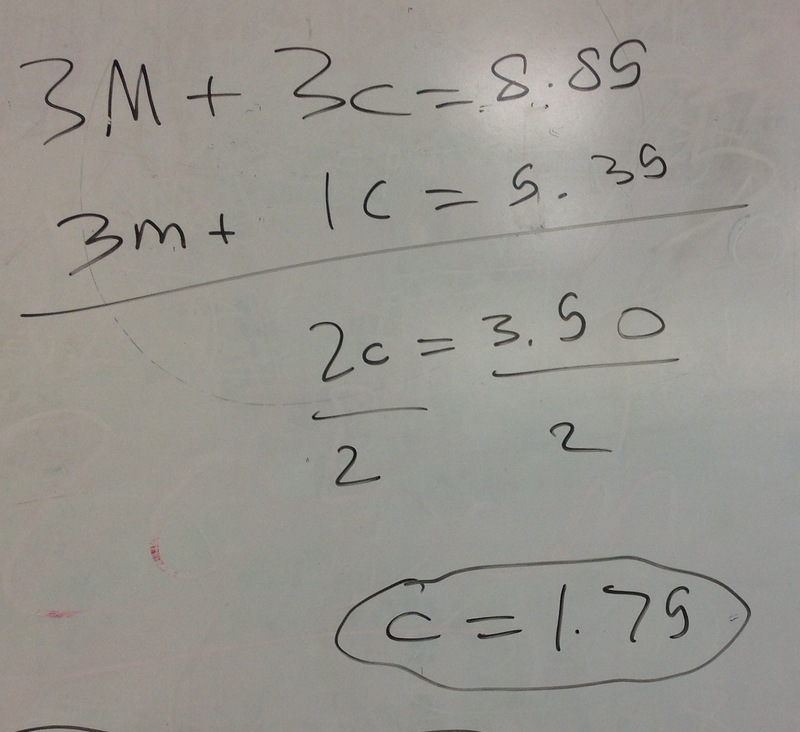 Sometimes I need to do some direct teaching right from the get go, like with expanding & factoring. Other times we explore & investigate by drawing & cutting out shapes, like with similar triangles & trigonometry. But in any case, maybe someone new to the MFM2P course (or not so new to it) will find these activities useful! I’m catching up on blogging about a couple of activities I did before my student teacher took over my classes. Here’s a brief overview & reflection about our Gummy Bear problem for linear systems. Estimate the cost of a red gummy bear? 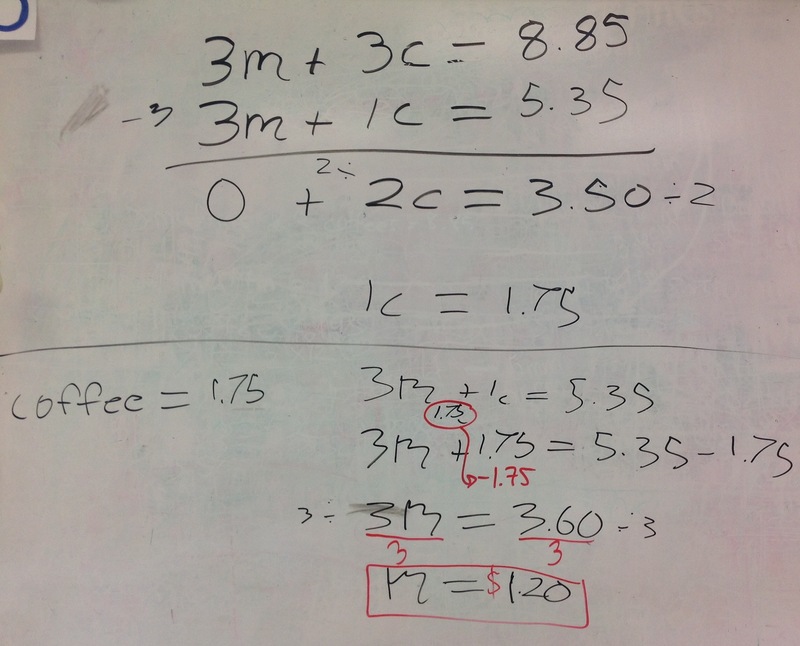 Using some direct teaching, I asked them to come up with an equation for each purchase if x represents the cost of 1 red candy and y represents the cost of 1 blue candy. Then I asked them to graph the two equations in Desmos & we looked at & talked about the point of intersection. The next day, we worked on this consolidation handout reviewing the most important new learning from yesterday. The rest of the second day was dedicated to this problem set on Khan Academy (they were encouraged to use Desmos to help them with it). A colleague suggested showing students one purchase at a time and asking them what some possible prices for each colour could be. I wondered whether or not this is a good context, because in reality, the blue & red gummy bears would not have different costs. Thoughts? Might this be a problem for students trying to understand the problem & context? 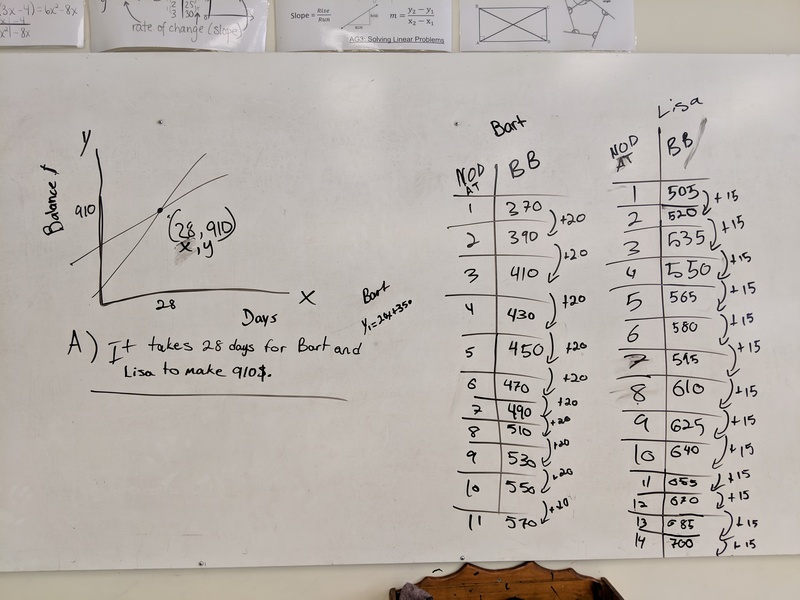 Another quick post to catch up on a problem-based lesson from the other week. This one was co-planned & co-taught with my student teacher, Nicole Darling. 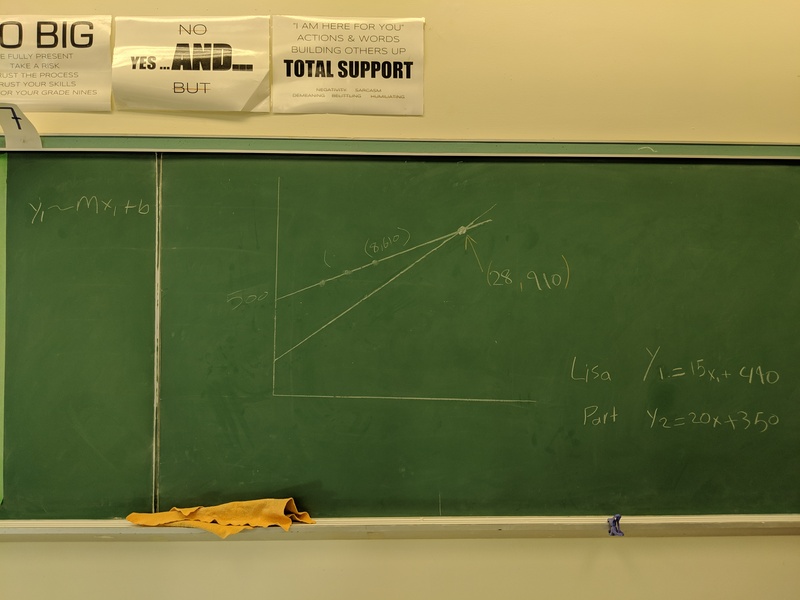 We made up a problem to do with selling t-shirts, comparing costs & number of shirts in order to teach the elimination method of solving linear systems. Your class is trying to raise money through selling t-shirts. There is a $150.00 set-up charge and each t-shirt costs $4.00 to make. You will be able to sell your t-shirts for $10.00. Most groups solved using a table or just by calculating the 150$ debt divided by the 6$ profit on each shirt to find 25 t-shirts. One group actually did substitution all on their own. Ms. 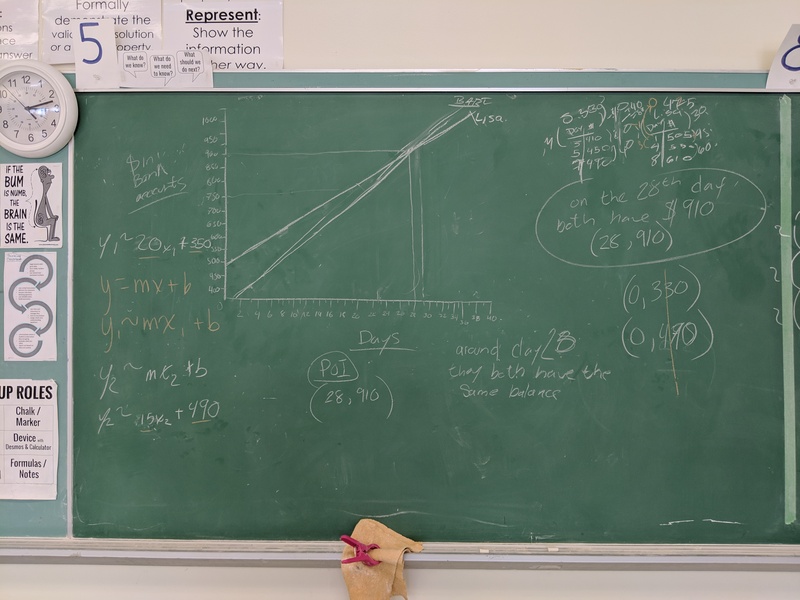 Darling then did some direct teaching on the substitution method w/ the class as a whole & sent them back to their boards to check their answer using this method. Interactive Pear Deck slide deck available here. I’m trying to blog more about my lessons/activities/problems this year. Today’s is more of a problem-based learning approach I guess. My goal was to review solving systems graphically with my grade 10 academic students. Lisa puts $3 in her piggy bank each week. She has a total of $19 in it as of today. Bart puts $1 in his piggy bank each week. He has a total of $9 in it as of today. When do they have the same amount of money in their piggy banks? Everybody used a table. I forgot to take photos of each board, but most groups answered that they will never have the same amount of money. Two groups worked their tables backwards to include negative numbers of weeks (before today). 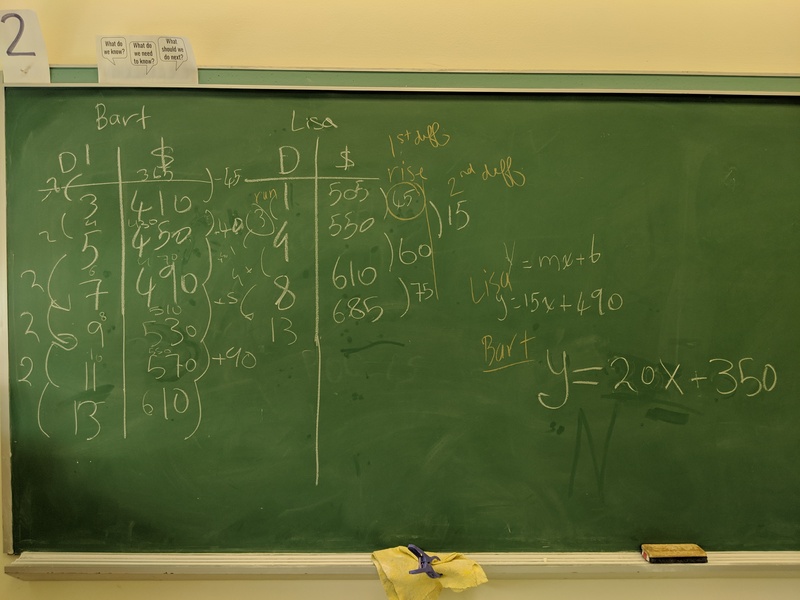 I then asked them to write an equation for Bart & Lisa each which we then graphed using a Pear Deck drawing slide. Pear Deck interactive slide deck available here. 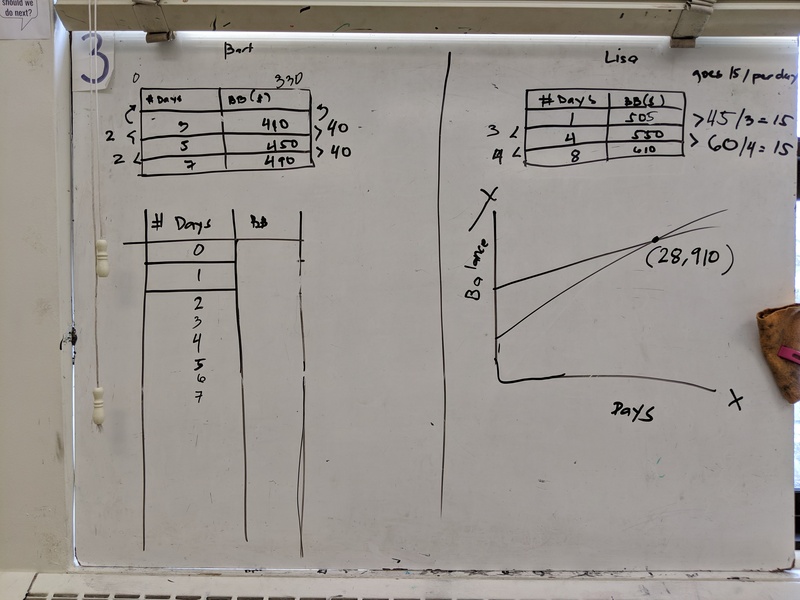 Last catch-up post from December; our cheese pies & drinks problem for linear systems in the Grade 10 applied class. Overview: I’ll break it down into the 3 acts. What do you notice & wonder? 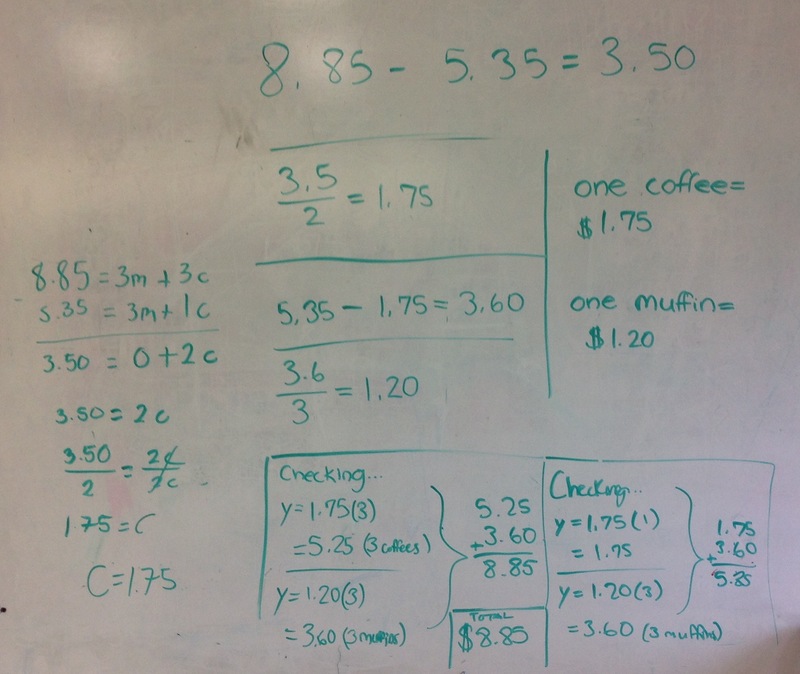 Groups went to their boards to solve: All of the groups subtracted the smaller order from the larger order twice in order to eliminate the cheese pies and leave the cost of 2 drinks, from which they easily determined the cost of 1 drink. Then went back to calculate the cost of a cheese pie. 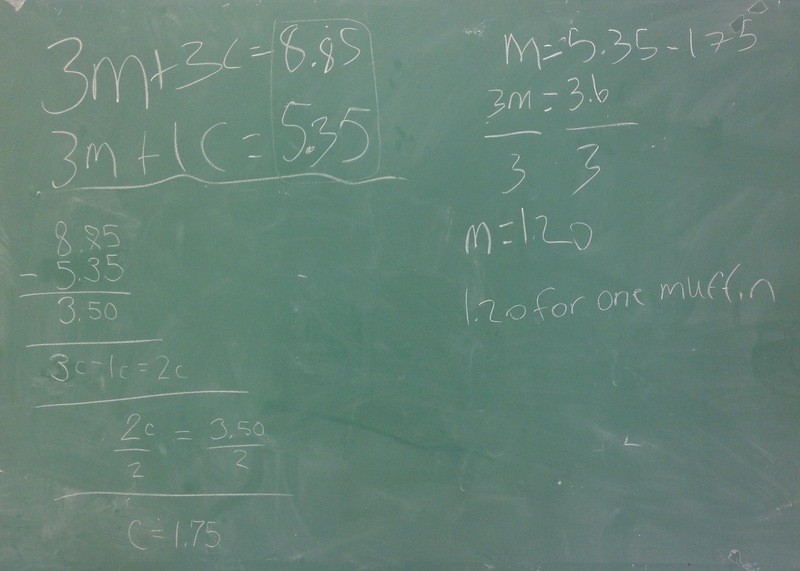 We discussed how the multiplying of “her” equation by 2 mimics how my students subtracted the smaller order two times in their solutions. We consolidated our learning about the elimination method by describing each step in the solution. Handout here. They had time to complete the homework on Khan Academy here. As always, the full folder of materials for this activity is here.